Well, no stitching for me. I got an inner ear infection (my first ever - my mom gets them all the time), which caused me to get very bad vertigo, which caused me to be sick. Dh went to the store and got me some motion sickness medicine. Thankfully it helped. I'm still a little queasy, but I am doing much better. I also messed up "Kindred Spirits." I didn't think the fabric looked right (dh said it looked like someone spilled orange Kool-Aid on it). So I decided to dye it a little darker. Well, I ended up dyeing it too dark. So then I decided to start over on a different piece of fabric (PTP Relic), but I didn't like that either. I hate it when I'm so picky! It drives me nuts. I should have just stuck with the original fabric because now that I look at the pictures again I see it looks fine. Oh well, I ended up ordering the recommended 40 ct. Days Gone By from Silkweaver. Hopefully I will get it fairly quick and then I can still get it stitched around Halloween. Oh no! Hope the vertigo stays away and you are feeling good! Hope you feel better & get the fabric quick so you stitch up Kindred Spirit. Oh, herzlich wünsche ich gute Besserung! I hope you will get well soon!!!! Yikes, hope you feel better soon! Sorry about Kindred Spirit. I never listen to my DH about fabric. LOL I'm just as picky too! Best wishes to you! OH I am so sorry to hear that you have middle ear infection! My brother had that after he graduated a really long time ago and they had a hard time back then diagnosing it. They have some really good treatments now for that so if you don't get much better I hope you can get into a great doctor! That must be sooooooo miserable! 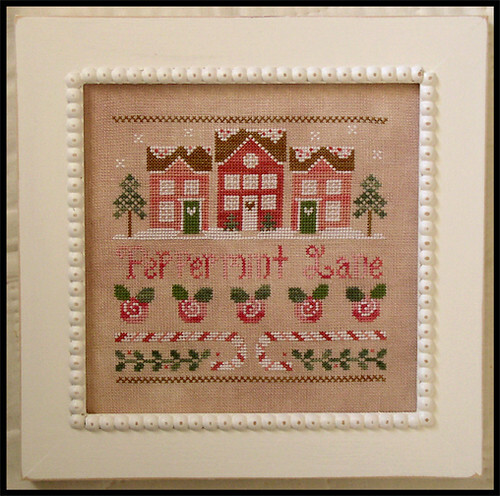 I too love the new design from Country Cottage Needleworks. I love all the reds and pinks! It is amazing that you can stitch feeling like you do! Take care and get well really fast! hope you are feeling better soon. Vertigo is no fun, i know. Looking forward to seeing your Acorn Hill! I love that design! Take care Nicole, I hope you feel better soon. Get well soon! Yep, the colors in that design are great! Ooh - it's lovely, and it's pink! I definitely see that in my future! Pepperment Lane is on my to buy list. Hope you feel better soon. I hope you feel better soon. Love that chart!